Heartburn No More Review: It is A Useless SCAM! You are here: Home / Blog / Heartburn No More Review: It is A Useless SCAM! 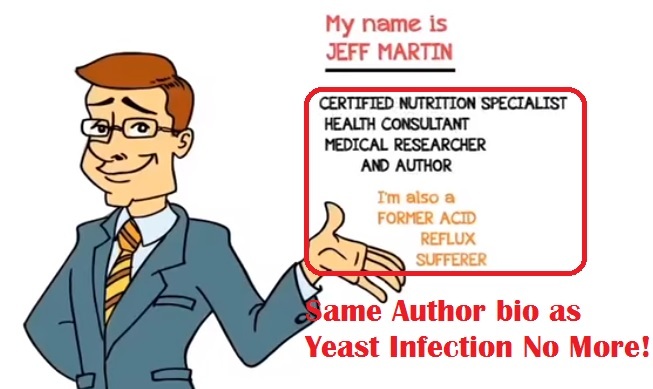 Heartburn No More by the so-called ‘Jeff Martin’ is a completely useless scam and in this review I’m going to put the final kibosh on this long running, unchecked, medical eyesore of a product made by the same scammer behind known scams Yeast Infection No More and Pregnancy Miracle! This review is going to be a short one because honestly speaking, Heartburn No More (link to website) doesn’t deserve a review in the first place! The only reason why I’m bothering myself writing this review is because of the fact that you will find no other honest review of this product online … and it has been around since 2005! I just can’t imagine how many heartburn or GERD (stomach acid reflux disease) sufferers have fallen for this scam. So its high time it got scrubbed off the internet … and its only you esteemed readers that can make that possible. Jeff Martin is Just A Shutterstock Photo (Does NOT Exist)! I believe the heading above has explained why I’m 1000% sure about this. For doubters, here is the link to the Shutterstock.com image. One more thing. Take a look at the screenshot of the presentation video below. That’s right. Check my Yeast Infection No More review and you’ll see that the scammer used the same author information, but changed the last sentence from ‘former yeast infection sufferer’ to ‘former acid reflux sufferer.’ The same scenario also played out at Pregnancy Miracle. It gets worse from here. 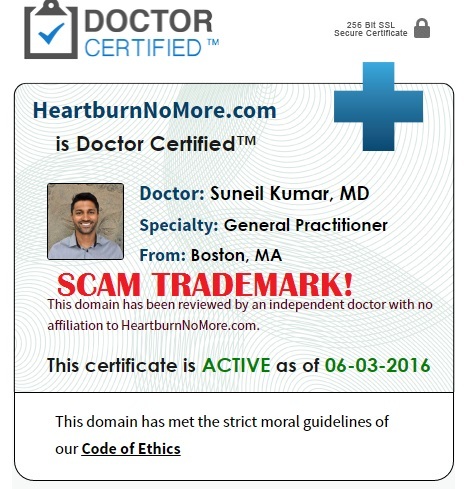 After looking at the Heartburn No More website and seeing its similarities with Yeast Infection No More and Pregnancy Miracle (same design, same video style, same narrative, similar claims), I expected to see the fake ‘Doctor-Certified’ logo bearing U.S-based Indian doctor Suneil Kumar’s ‘endorsement.’ floating on it. Well the scammer did not disappoint. Regular readers of Contra Health Scam should be familiar with this particular screenshot by now. This is because it has been used on a lot of health scam websites including Yeast Infection No More, ED Miracle, Red Smoothie Detox Factor, Pregnancy Miracle and The 3-Week Diet … and it is Contra Health Scam who exposed them all! WARNING: Any Website with a ‘Doctor Certified’ Logo Floating on It is a SCAM! Final Recommendation: DON’T BUY Heartburn No More. It is A Useless Scam! As I said earlier, this review will be short because as you can see, there is no point moving forward with it. And as for those who may be wondering whether the testimonials on the pop-up page are legit, please be informed that they are fake. In fact, I traced one of the testimonial photos – the photo bearing ‘Karyn Thompson (New Zealand)’ to be precise – to a scam website hawking a Hidradenitis Suppurativa eBook, and there it bears the name Melissa Brown from London, UK. This confirms that the photo was stolen and to further convince you without any doubt, the scammers behind that website have been exposed as South African cyber fraudsters who are now ‘begging for forgiveness,’ from the Hidradenitis Suppurativa community so that they won’t be reported to the FBI or FDA. Unfortunately for them, the community is not forgiving. This should be the fate of the scammer behind Heartburn No More (and also Yeast Infection No More and Pregnancy Miracle). They deserve to be in jail! In the meantime, spread the word to the relevant audience by sharing this review on social media, forums and discussion boards on acid reflux disease. It is especially important you do this because this is the only honest review of Heartburn No More on the internet! For those who have used Heartburn No More, please share your experience with the product with us. Thank you! Unfortunately there are too many snake-oil charlatans attempting to make themselves rch from others’ misery. That’s why I decided to write a definitive book on acid reflux and make it available FREE of charge. I see good popularity of this heartburn product but I am not sure it is helpful to me or not, need to research more. There is a money back guarantee with the product. How is it a scam if its been around for so long? Ok so you proved the photos might be fake. Have you tried it yourself. Do you suffer from acid reflux? please help me to tall much more about that produte scam is real or not ???? please……………………. you yourself are Founder/Passive Income Maker. I am sure you make money from this product yourself. your Facebook tell it all. no doubt you support the product. I am not sure u are a sufferer . it has 60 days money back guarantee from clickbank….clickbank isn’t a scam company…how could its a scam if it has money back guarantee ? did you buy and tried it ? thanks for sharing this. it’s information very helpful for me. Wow, thank you SO much! This site is awesome. I can tell you that I was suspicious when I noted the long drawn out video. I suffer from bad heartburn and this sounded too good to be true but I was tempted to try it. My pointed question is, why haven’t these people been brought to justice? It’s aggravating to say the least. thank you again. Notice to anyone considering paying $47 to download a pdf file. DON’T. wow! just wanted to thank you all for keeping an eye out for us…It really upsets me that these low life people take advantage of people who are sick and need help, that is truly sick!!!!! I hope that they know that wether they believe or not , they will die and face a higher authority who will judge them for being so greedy and heartless….. thank you, God bless you.